This was an eBay find in March 2002. I paid $550 with case, shipped. I believe this LB75 is a 1993 or '94 model. The pictures don't show some slight scratching and dings in the wood - nor did the eBay photos. This bass was well used by its previous owner(s), and it has a few minor battle scars. But fortunately none of them affect the playability. 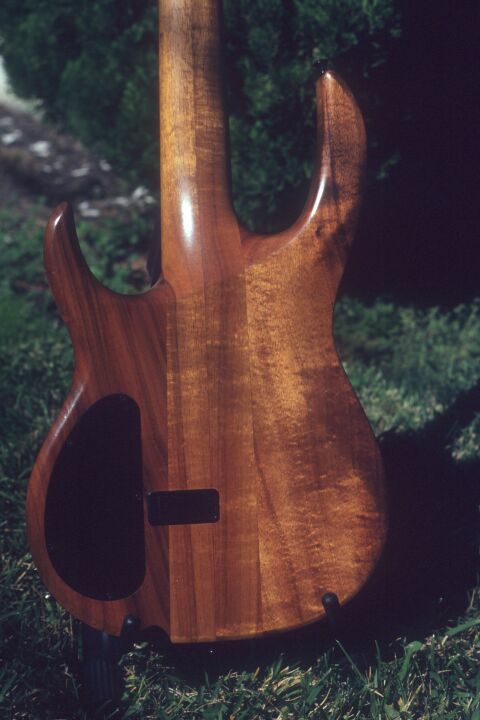 I like the tung oil finish on this bass for a few reasons. The first is that it is easily repaired at home with nothing more than sandpaper, steel wool, and some rags. I was able to remedy some of the worst battle scars around the neck pickup. Another advantage is that the neck is very fast. There's nothing like the feel of a tung oiled neck - very silky and not at all sticky. But most importantly, the tung oil shows off the grain of the koa wood like no other finish can. See the body pictures below for an example of how the appearance changes with the angle of the light. It's a looker and a great player. The tone, while adequate, could use some help. 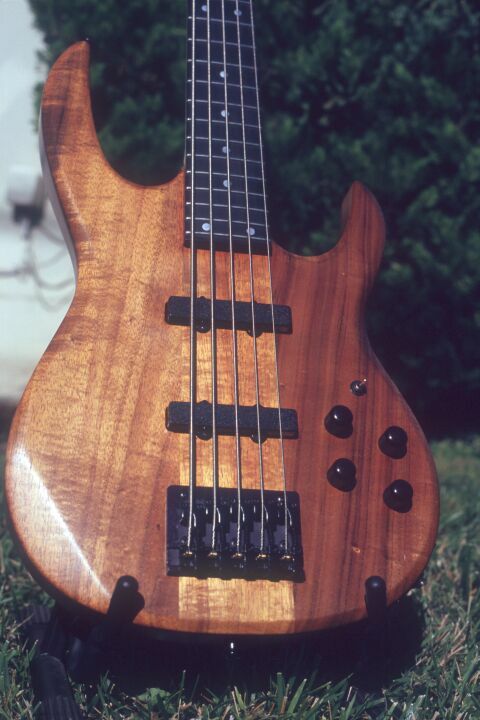 This bass is equipped with H50 stacked humbucking pickups. I believe these were the only J-style pickups Carvin offered at the time of manufacture. They're hum-free and the tone is OK, but they are a little soft on the low end. The electronics are full-time active, powered by a single 9V battery, and cannot be bypassed. Controls are master volume, pickup blend (pan), cut/boost bass and treble tone controls. This is Carvin's 2nd generation preamp, which uses 2 MC33178 chips, and thus has twice the power drain (and therefore half the battery life) of the current model preamp. Gain is fixed at about 6 dB; this bass puts out a fairly hot signal as a result. You definitely want to plug it in to the "Active" or "Low Gain" input on your amp. The toggle switch reverses the polarity (phase) of the bridge pickup, which I have not found very useful to date. I plan to install some Bartolini pickups and a current model Carvin preamp in this bass. And if the Barts don't cut it, Bill Lawrence J-45s are next. This bass is light and well-balanced, and the standard neck makes it more nimble than the wide neck of my koa/maple LB75. There's no neck dive to speak of. The neck has also proved to be very stable with changes in temperature and humidity. This is a very comfortable bass that can be played for hours on end! The tradeoff for the light weight and narrow neck is that the low B isn't quite as solid as on the koa/maple LB75. Like the rest of this bass, the Sperzel tuners and Wilkinson bridge are battle-scarred. The tuners are a little bit sticky, and the bridge's adjustment screws are bent and their heads partially stripped. Carvin no longer uses the Wilkinson bridge, probably in part because they don't wear well. I will probably replace the bridge with an ABM unit, or at least a current Carvin/Hipshot bridge, and I intend to get a replacement set of Sperzels as well. 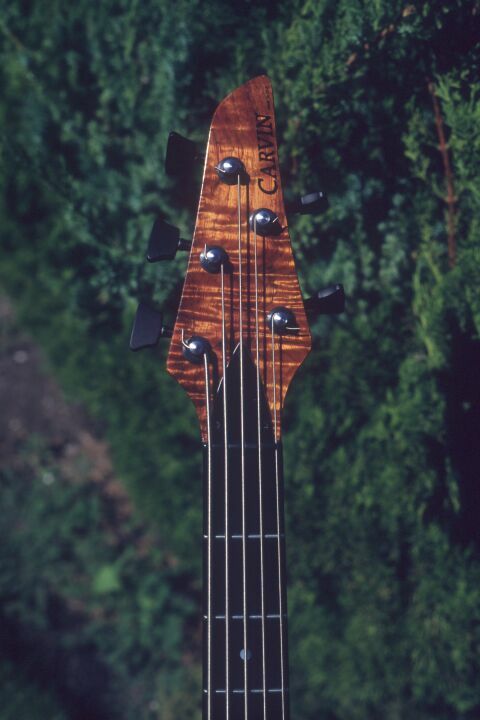 (Sperzel says Carvin no longer uses their bass tuners because Sperzel couldn't supply them in the volumes required; the tuners are still available direct from Sperzel though.) In the meantime it's plenty playable, if tedious to set up and tune because of the worn hardware. Tone is OK, not bad but not spectacular either. The H50 pickups won't impress anyone with their low bass response, unfortunately, and the lightness of this axe makes the low B a tad floppy. (The ABM bridge should improve the latter.) Sustain is superb despite the light weight. It's currently strung with Thomastik-Infeld Jazz Rounds. This is my first experience with these strings, and I find them a little floppy and dull sounding, but they're relatively smooth for roundwounds, and easy to bend and slide on. I'm sure better pickups would help balance out the tone. I previously had DR Sunbeams on it, which sounded good when new but went dead much more quickly than I expected. Here are some closer looks at this fine player. 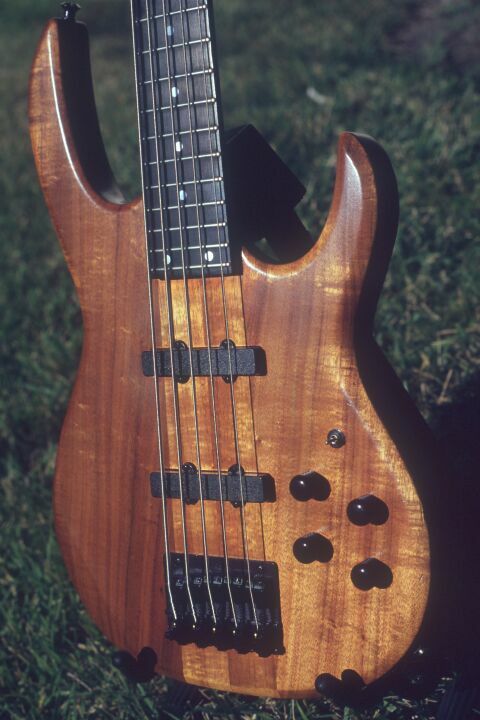 The figure in the flamed koa headstock overlay is just amazing! The two-piece neck and body seams are clearly visible in this rear view. This body closeup and the next show how the koa appears to change color as the lighting changes. Isn't the grain in that koa awe-inspiring? 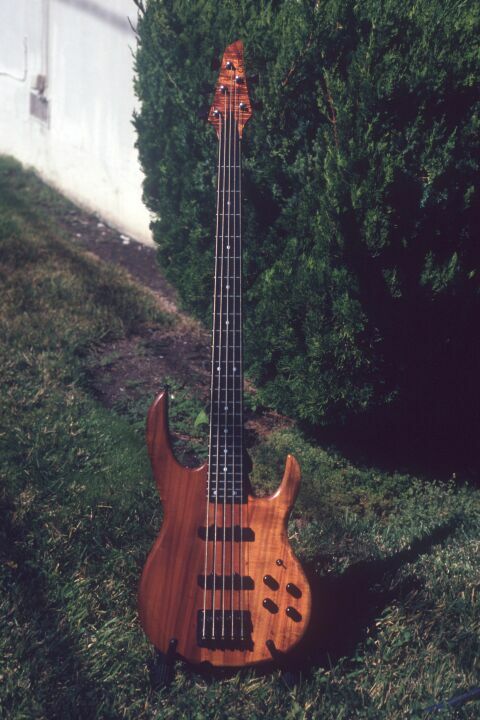 Koa LB75 / http://www.chucko.com/Carvin/LB75-koa.html / Copyright © 2002 Chuck Fry / All rights reserved.